I think my favorite thing about being a longarm quilter is getting to open a package and pull out fantastic patchwork on a regular basis. It’s delightful to “discover” what you’ve made, the shapes and colors and fabrics. I never know what will come out of that box! And then, I’m tasked with studying your quilt to consider a quilting pattern and thread to compliment. It’s really a pleasure! Here are some of the projects I’ve had the chance to work with recently. This quilt arrived early September, when we were still hitting 90 degrees on the regular in South Carolina. I was feeling quite “over” summer, but Pamela’s quilt gave me a rush of appreciation for the bright colors and high energy that summer conjures. I mean just look at those fabrics and shapes! This quilt is so strong! I suggested Orange Peel quilting for Pamela’s double wedding ring quilt. This simple, all-over design very subtly mimics the elongated oval shapes in the patchwork, while resonating with the happy floral prints. I think the quilting suits the quilt nicely, but mostly in a background kind of way. With such a powerful quilt top, my goal was to let the quilt speak for itself. Before we move on, I just have to point out the amazing mitered striped border on this quilt. I mean, wow! Pamela says she learned this technique in a class by Victoria Finley Wolf. It certainly makes a gorgeous frame for her double wedding ring patchwork. Rebecca was the first in a series of recent customers interested in semi-custom quilting. She’d created a special quilt for her husband based on the Legendary quilt pattern by Elizabeth Hartman. Rebecca wanted an edge-to-edge quilting design, but didn’t want any quilting on the two Bigfoot characters. She’d pieced them in plush fabric and knew that leaving them un-quilted would be better visually and to the touch. Excluding an area of the quilt from edge-to-edge quilting is totally possible. This type of quilt is “semi-custom” because it’s a modification of edge-to-edge quilting. It’s a great way to draw attention to particular areas of a quilt or reserve those areas for hand quilting. Summit quilting was perfect on this Legendary quilt. It creates that mountainous vibe and is nicely masculine to boot. Kathi described this quilt as for her teenage son, who loves marine biology. I have one of those teenage science-lovers, so, I was excited to see what she’d made. Opening the package was no disappointment. This quilt is minimal, modern and begging for some special quilting. But, we didn’t want to go over-the-top, because her son likes things simple. Hmmm…. My solution was to use the Wave quilting pattern, but with irregular spacing between waves. This variation adds interest without becoming a bit fussy. For this project, I needed to stay with the quilt the entire time and artistically set the spacing between waves. That bumps it up to semi-custom quilting, which adds a fee on top of normal edge-to-edge pricing, based on the additional time required. We were all very, very pleased with the way it came out! And one of my latest finishes was also a semi-custom job! 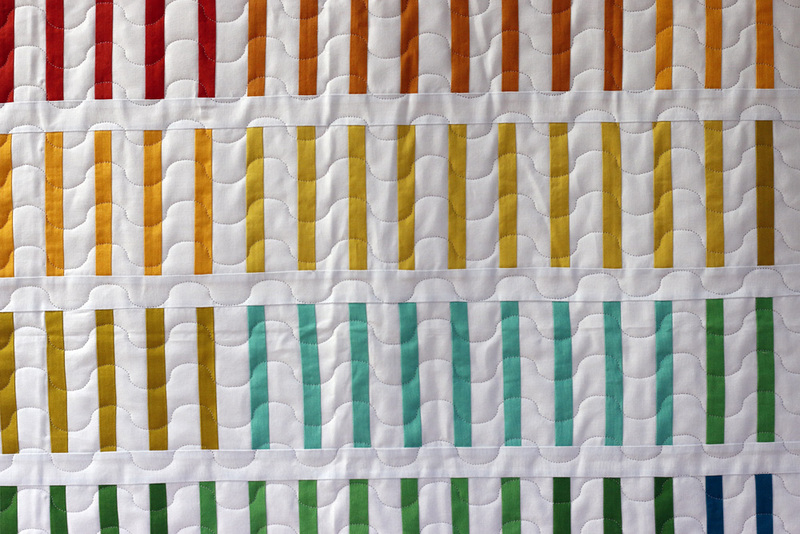 Introducing the Bartow quilt, a free pattern by Carolyn Friedlander in Kona cotton. Suzanne wanted to have a different pattern quilted in the border of the quilt as opposed to the quilt center. Border quilting can easily be ordered from the edge-to-edge service. There’s a drop-down for selecting a separate border, just like your options for batting. Suzanne’s quilt is scheduled to arrive today. I hope she loves how it turned out! Well, I have a full week of quilting ahead, so I’d better stop there. Speaking of my schedule, I’m accepting orders now to the quilted early November. If you have a project that you’d like me to quilt in time for holiday gifting, you’ll want to place your order in the next 3-4 weeks. I do expect to offer rush surface for an additional fee, as possible. But, to keep your costs down, ordering earlier does make the difference!